Aconite is most useful in acute attack of arthritis in the joints of the feet, but it is useful only in the beginning. Shooting pain with redness and swelling of joints. Joints swollen, oedematous, hot, white and waxy. Inflammation of the joints with stinging and burning pains, which are worse in warm room and by warm application and better by cold application and cold air. Bell. is indicated when there are cutting and tearing pains, running along the limbs like lightening. The joints are swollen, red, shining and hot. Rheumatic pains going from below upward. Swelling of feet and legs up to knees. Ball of great toe painful, swollen tendons stiff. Tensive pain and swelling in knee when walking. Soles painful, can hardly step on them. Affected parts become purple and puffy. Pains better when holding feet in ice-water. Bryo. is very useful in rheumatism. Joints swollen, tense, not very red. Pains worse on slightest motion or touch and relieved by rest, pressure and warmth. Stitching pain in right shoulder and upper arm with swelling. Stitching pain with swelling of right elbow joint. Sensation as if wrist were sprained on motion. Stabbing pain in hip joints. Stitching in hip joints, extending to knee. Stitches in knee when walking. Painful stiffness of knees with stitches on motion. Swelling of knee joints with tensive pain in ligaments. Red and shining swelling of knee joints, motion, impossible. Hot inflammatory swelling of feet with redness. Gouty swelling of heel with redness, heat and tensive pain. 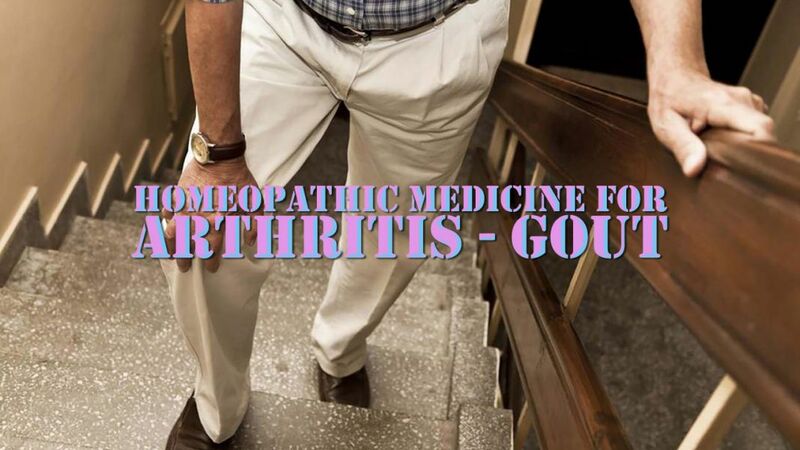 Gouty a rheumatic pain in all the limbs, worse slightest touch, motion or contact. Arnica is one of our most valuable remedies in particular (pertaining to joint) or muscular rheumatism arising from traumatic condition. In inflammatory rheumatism, it is useful when the great prostration, together with the excessive sensitiveness to touch is present. In all the conditions, the sore, bruised feeling is always present. Complaints are worse in damp cold weather. Joints inflamed, shining and red and sensitive to touch. Paralytic pain in all the joints during motion, as if bruised. Pain in all the limbs whether at rest or in motion. Limbs ache as if they had been beaten. Colchicum is useful in gouty or rheumatic conditions, especially if associated with gastric disturbances. It is indicated when the smaller joints, fingers, toes, wrists and ankles are affected. Joints are very sensitive to touch or jars. Large joints intensely red and hot. Small joints swollen, stiff and numb. Pains go from left to right. Pains are worse evening and night, motion, damp and cold weather. Causticum is of great value in those rheumatic conditions that present a paralytic condition with weakness usually single parts are affected. Tearing pains that shift rapidly from place to place. Tearing pains change place often. Tension in knee and ankle joints. Pain in ankle when sitting, better from walking. Severe pressive pain in ball of great toe. Complaints go from above downward. Pains drawing, tearing, sticking in limbs. Joints swollen and puffy red. Tearing pain in knees, worse at night, when sitting. Taring pain in great toes. Stinging and burning of great toe and in ball of toe. Tips of toes very painful when walking. Difficulty in knees on going up or down stairs. Dull pain in side of knees, worse when walking or extending legs. Stiffness of joints of foot. Shooting in joints of foot. Burning pain and shootings in ball of groat toe. Acute pains going from joint to joint with fever. Pains go from above downward in the joints. Pains shift from joint to joint, especially when beginning in upper extremities and then going to lower. Pains worse on least motion. Rheumatism from sudden exposure to cold winds or from sudden chill. Rhod. is useful in rheumatism of a gouty nature with arthritic swelling. Chronic rheumatism affecting the smaller joints and their ligaments. Acute inflammatory swelling of joints, wandering from one joint to another and at times reappearing in the first joint affected. Rheumatic pains in the right shoulder extending elbow. Violent tearing, boring pain, in left shoulder joint. Sensation as if the wrists were sprained. Aggravation during wet weather, cold weather, before storm. It is suited to nervous persons who dread a storm and are particularly afraid of thunder. It is indicated in affections which come on in the spring and autumn, the season of change. R.T. is one of the most valuable remedies in rheumatic conditions. Bruised or sprained pain in joints. Joints weak, stiff or red. Stiffness of knees and feet. Acute pain in ankle joint when running fast. Aching pains in ankle and arch of foot when walking. Sharp pain in heels when stepping up on it. Sense of stiffness on first moving the part after rest. Drawing or tearing pain in limbs during rest. Pain worse when beginning to move and better by continued motion, warm wrapping, rubbing. It is useful in rheumatism which is rarely highly inflammatory. Rheumatism caused by getting wet, especially the feet. Joints may be swollen with sharp stinging pain, which is usually erratic. Pain constantly change from place to place. Severe pain is in both shoulder joints. Rheumatic swelling in joints of the hand with redness. Hip joint is painful, as if dislocated. Painless swelling of the knee, when walking. Tearing, jerking and drawing pain in knees. Hot inflammatory rheumatic pains in knee. Knee inflamed, swollen with shooting pains. White shining swelling of knees. Wandering pains. Shift rapidly from one part of another with swelling and redness of the joints. Calc. Carb is useful in chronic rheumatic conditions of joints useful in gouty constitutions with nodes on fingers. Useful in all rheumatic conditions, aggravated from working in water and the change from dry to cold wet weather. Swelling of joints which are hot and red and very sensitive to touch. Arthritic pains in right shoulder joint. Stitches in left shoulder joint. Sprained pain in right wrist as if it had been dislocated. Knees hot, pale, swollen and very sensitive to touch. Great swelling of knee joint. Drawing and stinging in knee joint. Spongy swelling of knee joints. Pain in joints of shoulders, knees and feet. Left lower and right upper limbs most affected. Lyco is useful in chronic rheumatism. Rheumatic tension in right shoulder joint. Tearing pains in shoulder and elbow joints during rest. Pain in right wrist as from a sprain. Stiffness of fingers from arthritic nodosities. Stitching in right great toe. Knee ankles swollen and tender to touch. Rheumatic pains in wet weather.